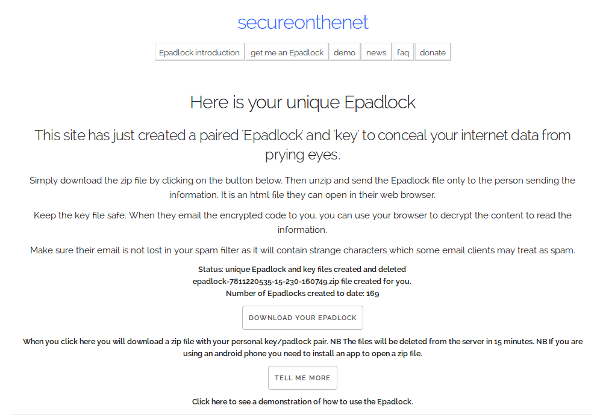 Click on the button or link Get me an Epadlock to generate a unique pair. The server will create a new pair and take you to download page. 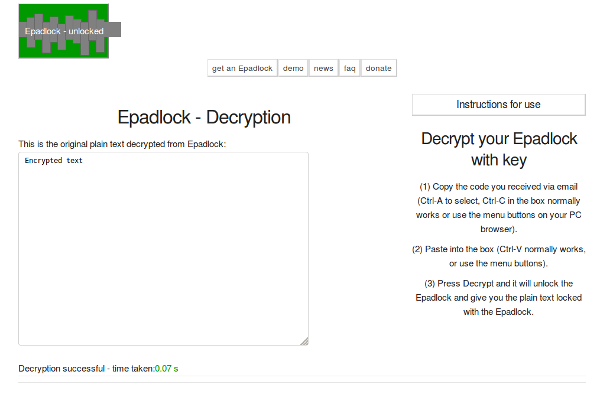 This page will show you that you have created unique Epadlock and key files which have been put into a zip file for you to download. You will then download the zip file to your computer. You can save the zip file to your PC - most PCs are able to deal with zip files, although Android tablets and phones might need to have suitable apps installed or use a browser like Dolphin. Keep the key file safe and send ONLY the lock file to the person sending the information to you. 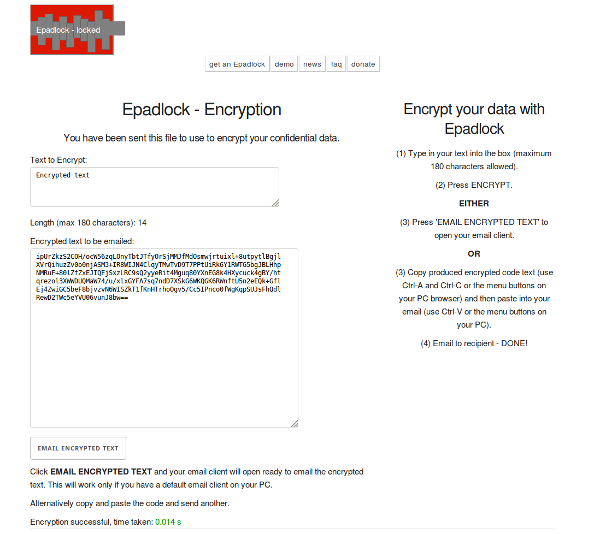 The sender opens the file and inputs the 'Text to encrypt' then emails the resulting encrypted text to you. Either by (1) Using the EMAIL ENCRYPTED TEXT button to add the text to an new email with subject 'Information' - they just add address and send. or (2) Copy and pasting into an existing email message. Make sure the encrypted text is sent to the keyholder - to use 'EMAIL ENCRYPTED TEXT' they need email client on their PC. The email will have subject 'Information' if they use the email button, or other pre-arranged subject. Open the key file in your browser and copy and paste the code from the email into the key file text box. Check your email Inbox for the message and make sure it is not treated as spam. Copy just the code into the text box. 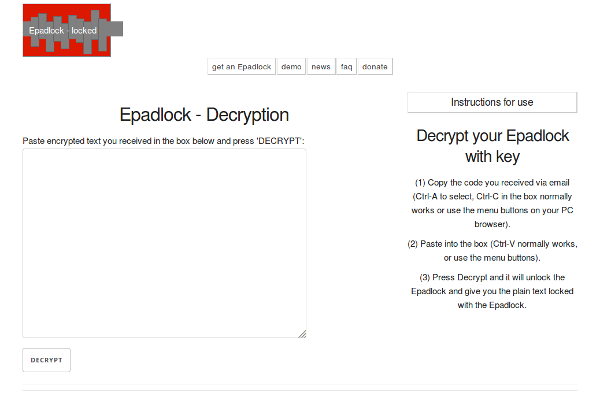 Message will show in the key file when you press DECRYPT. 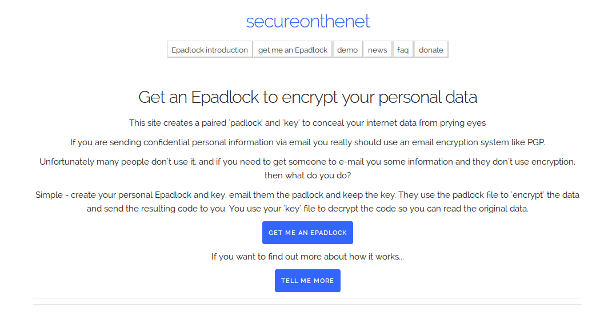 If you need an Epadlock to keep your data safe then click on the box below to get started now.